They say 18 holes is a golf course and 36 holes is a golf destination. Destination Kohler is home to four championship caliber courses – The River, Meadow Valleys, The Irish and The Straits – placing Herb Kohler’s labor of love in rarified air. 2018 is a distinctive year of milestones for Destination Kohler. The American Club, recently selected by Condé Nast Traveler as the #1 resort in the Midwest, will celebrate its 100th birthday. Building upon this century of distinguished service and attention to detail, The American Club has cemented itself as Wisconsin’s premier resort. Additionally, Blackwolf Run will commence its 30th season of operation since opening in 1988, as well as The Straits, which will celebrate 20 years. Ranked No. 4 in Golf Digest’s “America’s 100 Greatest Public Courses”, Dye’s time-honored trademark of visual intimidation keeps golfers on their toes. The longest par 5 on The Straits, Hole 11 or “Sand Box,” gets its name from the well-placed, railroad-tie-lined bunker that runs down the left, giving the impression of a much tighter landing area for second shots. “Cliff Hanger” is another, as Hole 13’s par-4 green looks inviting, yet sits on a precipice high above Lake Michigan. Players will need to bring their A-game to tackle the track that’s seen Vijay Singh, Martin Kaymer and Jason Day crowned major champions. Just inland of The Straits sits The Irish. By masterfully routing the course through large dunes, Dye sculpted a little piece of Ireland in Wisconsin. Hole 13 is named “Blind Man’s Bluff” and features a sunken green obscured by a large dune like the famous “Dell Hole” at Lahinch Golf Club in County Clare. The winding creek cutting the fairway in half on the par-4 ninth affects not only one’s strategy off the tee, but then again on the approach as it dashes across the front of the green. Both memorable and traditional, The Irish proves there is no need to purchase a plane ticket to the Emerald Isle to get a taste of golf in the Old World. The Meadow Valleys course flows along the natural features of the surrounding terrain, winding through natural pastures and ravines. The par-4 10th is a hole like no other at Blackwolf Run, featuring a daunting tee shot through the trees and approach to the smallest green on the course. Overlooking the picturesque Blackwolf Run Clubhouse, the dramatic par 4 finisher is another particularly memorable hole, thanks to its enormous double green guarded by water in front. The Inn on Woodlake is a charming 138-room hotel featuring traditional and unique room types and suites. New in January 2018, The Inn will unveil new multibedroom suites that can accommodate up to eight guests, pairing wonderfully for your next family or buddies golf trip. Inclusive of two nights at The American Club or Inn on Woodlake, the Golf Kohler package features three 18-hole rounds of golf. This entails cart fees at Blackwolf Run, forecaddie fees on River and Meadow Valley courses, and caddie fees on The Straits and Irish courses, along with a 30-minute golf lesson at the Kohler Golf Academy, 20-percent off Kohler Waters Spa services, and much more. Another fun option is the Dye-Abolical Package. In a place where Pete Dye’s imaginative legacy is on full display, guests can stay for three nights in The American Club, or Inn on Woodlake while playing all four of his signature designs. Also inclusive of cart fees at Blackwolf Run, forecaddie fees on River and Meadow Valley courses, and caddie fees on The Straits and Irish courses, guests receive unlimited use of practice facilities, a pouch of logoed items, and other amenities for an experience they won’t soon forget. Destination Kohler is located only one hour north of Milwaukee (MKE), one hour south of Green Bay (GRB), and two hours north of Chicago (ORD or MDW). 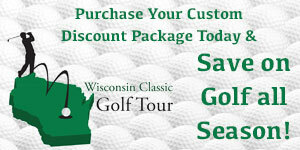 For more information or reservations, call 866-446-5170 or visit GolfKohler.com.